When it comes to monitors, size does matter! In fact, everything staying the same, a large monitor feels awesome to game on but size unfortunately does not make a monitor gaming friendly. Picking the best 27 inch gaming monitor involves lot other factors that don't really apply much to smaller monitors. Plenty of connectivity options, the Asus ROG SWIFT is a crowd favorite. It offers G-Sync and has a refresh rate of 165Hz though to exploit its full gaming potential you need to connect via the DisplayPort as HDMI caps the refresh rate at 60Hz. 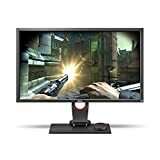 It is a wide screen Ultra High definition monitor with IPS display that does a spectacular job in color reproduction, refresh rates and overall gaming experience. While in the past the ROG SWIFT suffered from back light bleeding, current iterations of this model have that fixed. This monitor needs a bit of finetuning the first time you use it since it comes factory tuned and may not suit the way you game. Thankfully, the Asus software helps as it is simple to use with custom profiles to save multiple settings. 165Hz refresh rate with G-Sync together ensures zero screen tear and little input lag. IPS display with vibrant color reproduction and excellent contrast ratios. Wide angle UHD display is a treat to the eyes. It uses IPS display technology, and unfortunately, there is some backlight bleed to the sides when the screen is dark. HDMI port is obsolete on this model; only DisplayPort gives you a refresh rate above 60Hz. Another competition centric monitor, BenQ ZOWIE XL2730 looks great once you have calibrated the washed out colors. With plenty of input options and a high screen resolution of 2560 by 1440 pixels, you should extract the most from your graphics card, but it may take a couple of days to get used to the monitor’s washed out colors. Probably the biggest con of this monitor is its lack of color vibrancy, especially if you are moving from an IPS display. BenQ is aggressively pushing itself as a gamer centric brand as evidenced by all the sponsored gaming events. Though this particular model sports high refresh rates, it does not support G-Sync or FreeSync, and that might be a turn off for some. However, it is the only monitor in this price range to offer UHD resolution. 1-2-3 profile quick change remote helps with personal presets for gaming, browsing, and videos. UHD resolutions on a wide screen improve overall gaming experience. Viewing angles are a bit constricting. The screen tends to gather dust and will lose its crispness over time. If you have a powerful gaming rig but a limited budget for a 27-inch monitor, the Acer Predator XB271H is what you should buy. This acer monitor is a scientific marvel as it uses a TN panel but manages to give excellent contrast ratios, color reproduction while retaining a 1ms response time and zero input lag. No wonder, competitive gamers across the world love the Acer Predator XB271H. 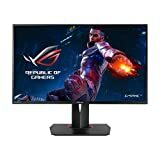 The best 27-inch gaming monitor for competitions and online gaming, setting up this monitor does not take long. We just love the design of the stand, the bezels and everything about this monitor. In fact, it looks ultra-gaming and feels the same too. Just remember to pair your monitor using DisplayPort with your Nvidia graphics card if you want to use the G-sync feature. And if your graphics card is capable enough, you can even overclock the refresh rate up to 180Hz from 144Hz. 144Hz refresh rate ensures smooth frame changes. You can overclock to 180Hz if your graphics card can support it. G-Sync with wider viewing angles and better contrast rates. It looks awesome with its red ascent lines and black contour. TN panel needs some calibration for perfect color reproduction. Response Time: 1ms. Flicker-less Technology-Reduces annoying screen flickering that can cause eye strain when viewing the monitor for long periods. Probably the only non-gaming monitor in our list but the VIOTEK NB27C is worth mentioning due to its low price. It has a refresh rate of 60Hz, which isn’t great for gaming but it is okay if your hardware is a bit outdated. HDMI is your only valid option considering the resolution is capped at 1920 by 1080 pixels, but the curved display does add to the experience. We aren’t big fans of low cost monitors, but when we got a chance to try the VIOTEK NB27C, we were taken aback by its simplicity and affordable performance. Yes, it lacks a lot of gaming features but more than makes up for it thanks to a balanced visual experience. If you just can’t spend on an expensive 27-inch monitor but want a large screen for casual gaming, get this monitor instead. The cheapest option available in the 27-inch category with some gaming features. Curved display adds to the overall experience. 60Hz refresh rate isn’t a lot, especially with the 1080p resolution. Needs calibration depending on the type of gaming you are playing. Asus ROG monitors boast the best gaming technology in the market, but the VG series isn’t gaming centric. Though it offers some gaming features such as FreeSync and a 75Hz refresh rate, this monitor is best paired with a console. Nevertheless, if you have an AMD graphics card, you can extract the most out of this gaming monitor. Just remember, to calibrate the colors a bit to your environment. 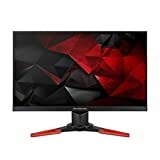 There is a 144Hz edition of the same monitor, but it is hard to buy brand new. If you can find yourself a refurbished unit with 144Hz refresh rate, we would suggest spending on that as it is an absolute steal for all the things it offers. Affordable with good color reproduction and gaming centric features. Sturdy stand with wide viewing angles. The 144Hz edition is hard to find though 75Hz is still quite good. The 27-inch gaming monitor niche isn’t as crowded as the 24 inches or 21 inches niche, but it is harder to find the best 27 inch gaming monitor. At 27 inches, the resolution starts playing a bigger role. Up until 24 inches, it is hard to differentiate between 2K and 4K. However, on a 27-inch monitor, the differences are crystal clear. Naturally, certain criteria hold more weight than others when choosing the best 27 inch gaming monitor. Whether you build gaming rigs every waking moment of your life or are a noob, the only real way to find the perfect gaming monitor is to read a lot, research and make up your mind. Gone are the days of vertical sync and 50Hz monitors. Before you buy a monitor, better upgrade your knowledge on gaming monitors. All 27-inch gaming monitors are at the very least full HD. When you deal with 27 inches of diagonal screen width, 1,920 by 1,080 pixels is the bare minimum you need for clear picture rendering. However, if you want to push the current boundaries of gaming, we suggest buying a monitor capable of ultra HD resolution. When we say ultra HD resolution, we are referring to crazy ratios such as 2,560 pixels by 1,440 pixels (QHD) or even a 4K UHD resolution. Anything smaller than 27 inches won’t give you much of a difference in actual picture quality due to a rise in resolution. However, monitors measuring 27 inches or more have sufficient screen surface area to truly show the difference in clarity between HD and UHD resolution. Just a word of advice, anything higher than HD resolution will need a capable graphics card. Current generation graphics cards are adept at rendering 1080p images without breaking a sweat, but even the costliest graphics cards will struggle to maintain a steady framerate with 4K UHD resolution. You might want to consider your hardware capability first before joining the ultra-high definition bandwagon. What Panel Type To Pick? There’s a lot of debate on the panel type and benefits of each. However, we aren’t going to rehash the debate here. Instead, let’s just say that it is a matter of personal preference. TN Panels are affordable and have decent contrast ratios, but they suffer from horrible viewing angles and color distortion. Not our choice but if you need a rapid response time of 1ms or even lower and high refresh rates, this is your only option. In fact, many professional gamers prefer TN panel monitors as they believe it gives them the cutting edge in competitive gaming. However, if you want crisp color reproduction, wider viewing angles, and utmost clarity, pick an IPS display. Just keep in mind that large IPS displays are expensive and suffer from low refresh rates and response time. Naturally, 27 inch IPS displays cost a lot of money. Our suggestion is to go for the in-between VA or Vertical Alignment panels. These offer a balance between TN panels and IPS displays. They have good viewing angles, decent color accuracy, constant refresh rates and response times with an impressive contrast ratio. Competitive or not, VA panel is a good compromise at a fair price. You can think of refresh rate as the speed with which a display can change between pictures. Hence, 60Hz refresh rate is equal to 60 screen updates every second. Now, there’s a lot of debate raging in gaming communities that higher refresh rates improve gaming experience, but it only applies to competitive settings where a millisecond can decide who wins and who loses. Typically, you want a monitor with higher refresh rates though 60Hz is the least you will get with any 27 inch screen. The problem with 60Hz is that it isn’t great with quick movements in games or movies. Rapid scenes often appear ripped or blurry, which is also known as screen tearing. How long does a monitor’s pixel take to change from one shade of gray to another? Response time decides the smoothness of video rendering. Ideally, you want anything below 4ms response time though, 1ms is the standard across professional gaming circles. Again, lower the response time, higher the cost of a gaming monitor. Not many folks consider input lag as a factor when deciding the best 27-inch gaming monitor but we feel it is just as important as screen resolution or refresh rate. In our tests, we found that an input lag of 30ms or less is acceptable because anything more and even a casual gamer will begin noticing glitches. When you have a higher input lag, your commands take longer to translate into action on screen and that can be the difference between being the savior or the sloth who got his teammates killed. Remember screen tearing? We briefly touched on this subject earlier. Earlier, there wasn’t much that monitor makers could do to reduce screen tearing. However, through active hardware participation, it is now possible to reduce screen tearing to a minimum but only if you have a compatible monitor. When your monitor displays information from more than one frame in a single screen draw, you experience screen tearing. It is because the GPU generates frames faster than the monitor’s refresh rate. As you progress through a game and the environment changes, in-game framerates move up and down, but your monitor refresh rate stays the same, which causes screen tear. Up until recently, V-sync was the only option you had to counter screen tearing, which is a software solution that buffered frames before sending them out to the monitor. The downside to buffering screens is an increase in input lag. Today, if you can spend the money, you can get hardware accelerated sync also known as G-sync from Nvidia and FreeSync from AMD. The trick is to match your monitor to the chipset company of your graphics card. 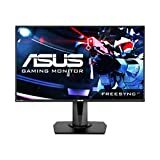 If you use Nvidia cards, get a G-sync monitor and likewise FreeSync for AMD cards. We hate monitors that force us to use a particular input technology. Ideally, you want your monitor to have match the best output option available on your graphics card. HDMI, DisplayPort, DVI or USB 3.0 are the current generation inputs that offer high speed and high bandwidth data transfer. 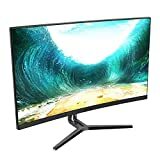 Be careful to first match the monitor input options to your existing graphics card ports before deciding on the best 27 inch gaming monitor for your rig. Other than the factors we discussed above, there are a few additional features that you might come across in the 27-inch monitor segment. Note that none of these extras mean much to your gaming experience other than making life easier for you. High quality speakers built into the panel might seem futuristic, but they won’t perform like quality headsets or 5.1 surround speakers. Mounting devices and special stands are good if you like the possibilities but not necessary if you have a table to hold your monitor upright. In short, don’t get swayed by the extras – what you need is a kickass gaming monitor, not a gimmick. The more advanced or gaming centric a monitor is, the more you end up paying. High resolution 27-inch monitors with either G-sync or FreeSync costs a lot more than an HD 27inch 1ms response time monitor. Decide your budget first and then pick the best 27 inch gaming monitor. Our best 27-inch gaming monitor guide is not complete but rather comprehensive. It is a guide to get you started with your research. If you stick to the points we mentioned, you should find a suitable monitor for your gaming rig. However, in the event you feel too bogged down doing your research, just select any of the top five 27-inch screens we loved – they should serve you well for years to come.